Marshall freshman (and Washington High School Class of 2018 member) Maddy Garrison (5753) competes in her first collegiate cross country race Saturday, Sept. 1, 2018 at Northern Kentucky University. Garrison was the first member of her team to cross the finish line, placing 55th in a time of 19.32.3. 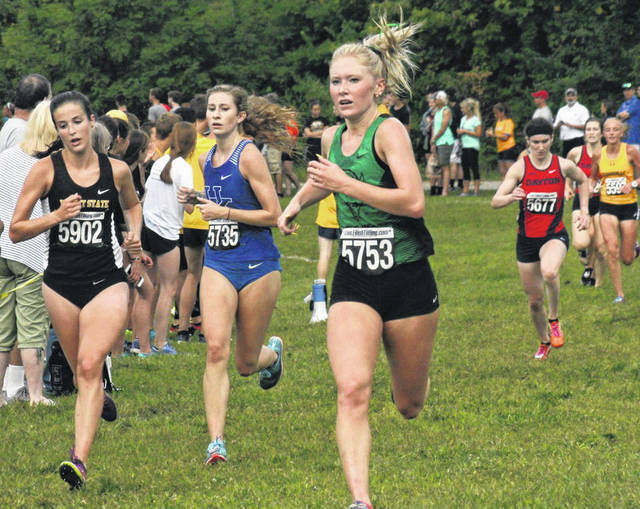 HIGHLAND HEIGHTS, Ky. — Marshall cross country ran its first meet of the 2018 season Saturday, Sept. 1 at the Queen City Invitational on the campus of Northern Kentucky University. Out of 15 men’s teams, Marshall finished ninth (262 points) and out of 13 women’s teams, the Herd finished 11th (335 points). Leading the way individually for each side was junior Alex Minor and freshman Madelyn Garrison. For the men’s team running in a 5K for the only time this season, Minor finished 28th with a time of 16:00.0. Senior Nick Schmidt came through next at 16:16.7 in 40th place. Freshman Ian Domenick ran in 16:37.4, coming in 74th. Rounding out the top-five was a duo of sophomores with Coy Smith in 86th (16:45.4) and Josh Endres in 90th (16:48.7). For the women’s team, three of the top-four finishers competed in their first collegiate race. Garrison’s 55th place finish and time of 19:32.3 led the way, followed by freshman Alexandra Evans in 81st (20:14.7). Junior Mary Kerby finished 95th with a time of 20:41.2. Freshman Myah McAlister finished in 102nd with a time of 20:57.1, followed by junior Audreana Lewis in 121st (22:05.3). The team is back in action in two weeks at the Winthrop Invitational on September 15 in Rock Hill, South Carolina. https://www.recordherald.com/wp-content/uploads/sites/27/2018/09/web1_Maddy-Garrison-win-cc-run-for-Marshall.jpgMarshall freshman (and Washington High School Class of 2018 member) Maddy Garrison (5753) competes in her first collegiate cross country race Saturday, Sept. 1, 2018 at Northern Kentucky University. Garrison was the first member of her team to cross the finish line, placing 55th in a time of 19.32.3.